The College is concerned about the whereabouts of Anthony Soh (also known as Yen) who is a first year Mechanical Engineering student at Imperial. He was last seen in the Students’ Union bar in Beit Quad on the South Kensington Campus (Prince Consort Road SW7 2BB) at 23.00 on Tuesday evening (22 March) and is believed to have left there to return to his accommodation in Wilson House close to Paddington station (Sussex Gardens, W2 1UF). The police are treating Anthony Soh as a missing person and are appealing for information. Anthony is described as oriental, with short, dark hair. He was last seen wearing a checked blue/white/green hooded top, blue jeans, a purple t-shirt and blue suede plimsolls. Anthony is described as oriental, with short, dark hair. He was last seen wearing a checked blue/white/green hooded top, blue jeans, a purple t-shirt and blue suede plimsolls (pictured above) when he went missing - have you seen him? I have had a request to look at tarot for Anthony Soh. Tarot gives past present and future information which will appear sometimes in a random order but does often throw a lot of light on various issues. Please note tarot is not 100 per cent accurate and to look at other sources of accurate and evidential information. This card that I have immediately makes me feel that making money is very important to Anthony. He seems to have been juggling two things at once which makes me wonder whether he had another money making outlet besides going to college. I am not sure if thats the case but I mention this because it is what stood out to me initially. I seem to see that the Pentacles could lead him to the Bank and that he did have a message of some description which may have made him change direction having left the bar that he was in. The direction on this card is often NORTH - it can lead alongside a canal or body of water though this is not ALWAYS correct it is worth posting as a possibility. I have not yet looked at the map of the campus. I see him at recreation initially in this card which may indicate him at the club he was in before leaving but at the same time regarding the message this message may be negative as it can indicate anxieties trouble and embroilment. There seems to be some financial worry or embarrassment that comes to the table here and I am not sure why that is at the moment. However I do have a change of location or direction on this card so it makes me feel that if he intended to walk back to his accommodation something came up to swing him to another direction and that is possibly where the message comes in. He may even have thought of going to the Bank though that is just a thought - did he owe anyone any money? seems to be a financial curve coming into play here. Though it is not always easy to guarantee a direction I feel that Anthony could currently be South though this card upright is normally North which is what has appeared in the first card. This card is often a masculine type of energy on this card and a grasping feeling. It is also an indication of tools and action. Someone might not have had Anthonys interests at heart here as this is a very strong male energy around him. I wander if he has actually gone far as there are buildings in the picture of this card it is not a complete wasteland. I just feel he did,nt go that far I could be wrong but he may not be that far from buildings. I get the feeling that somebody might have been hostile to him because there is some form of male persecution in this card. I feel as though there may be a connection to the past with the Judgement card with its wake up call so again I think perhaps one could look more around the vincinity - town he was in at time of disappearance. Asking when Anthony will be found I feel this could be before May and Kings always give us a 14 to go by. I do not have a year for this but we have to be hopeful and assume it is the current year time. I am feeling he will be found however as I have an indication of this via the Heirophant. I also think someone might find a key which is very possible and there may be two people that surface in respect of finding Anthony. I seem to see someone building a new house and some finances around this, I dont know why this is coming up and might just be 'white noise' in the reading but I leave it anyway. I do think Anthony will be found and I hope that tarot has a good indication of what is the situation in his case. I also have a possible apartment here that belongs to a businessman. Not sure where that comes in but will mention it. I seem to feel someone has a very expensive looking car. I also have an accountant or someone that owns properties. This may all be insignificant but it is there so I will print it. It may also be worth looking in Hyde Park or any canals or embankments as water is in the card. I say that just in case. I shall keep an eye on the press to see that he has been found or hope that a blogger reader can inform me. I am so sorry to report this news, but Anthony seems to have been found deceased. Tarot was quite right on this occasion and he was found in Hyde Park in the water. I wish to convey my sympathies to his family and hope that if there is any foul play in this case that it comes to light. I will report anything if tarot has uncovered any other aspects. The family of a missing student from a leading university were devastated today after his body was found in London's Serpentine lake. Anthony Soh, 18, disappeared after a night out with friends at the Student Union of Imperial College in West London on March 22. His desperate family and friends launched a massive hunt, as well as using Facebook and Twitter, to find the troubled student. But the search has now been called off after a walker spotted a corpse floating in the Hyde Park lake, Central London, yesterday morning. Police pulled the body from the lake a short time later just before lunchtime. The teenager was last seen enjoying drinks 15 days ago with around 10 friends at the Student Union bar at the Imperial campus in West London. Friends say they borrowed his phone to call another friend but as they did the first-year mechanical engineering student, who had drunk about six pints, ran off down Prince Consort Road in South Kensington. CCTV footage showed Anthony near the stairs of the Royal Albert Hall, but there was no other trace of him. A student drowned in the Serpentine after downing pints in a drinking game during an "all you can drink" promotion at a London university, an inquest heard today. Anthony Soh, 18, who had been out celebrating the end of term, had told friends that he planned to jump into the lake in Hyde Park as a celebration when his exams were over. The first year mechanical engineering student at Imperial College was last seen outside the student union's Metric bar in Kensington on March 22. He told friends he was running back to his halls of residence on the other side of Hyde Park. A search was launched after he failed to show up to lectures the next day. His body was found by a woman riding a pedalo in the Serpentine two weeks later. Course-mate Anthony Foon Lum Tsoi, who had been out with Mr Soh on the night he disappeared, said: "We attended the open bar. You pay an entry fee to the bar, which was £7, and you can get as many beers as you like without extra charge and that would be until the bar closes." When asked about a coin game the group were playing, he said: "It is a game where you would get a penny and if you drop it into a glass when someone is holding it they have to finish their drink." Mr Soh, who took caffeine tablets and was described as "lively" and "trying to say something to everyone" on the day he disappeared, had to down a pint within 30 seconds twice. Mr Tsoi said his friend drank a bottle of beer before he left home and then three pints on the night. Recording a verdict of accidental death, Westminster coroner Dr Fiona Walker said: "Although there is absolutely no evidence of how he entered the Serpentine there is no evidence of foul play or any injuries. "Whether he slipped or deliberately jumped in then he unfortunately died as a result of cold water shock. "This is no doubt an absolutely tragic loss of life of such a young man on the brink of his life." Thank you Empathy. Here is a map of Hyde Park - http://tinyurl.com/6yfjo9z . I cant get those urls to work unfortunately but I will do a search to see if I can find the appropriate pictures. I am also pleased there will be a search. I cannot guarantee tarots ideas on location as you know I only print what I see and have to hope that it gives some clues. Time will tell but I am behind every search with a positive support ethic. Have now posted a picture of Anthony in the clothes he was wearing when he went missing. Thank you Empathy. No sign of Anthony yet. Edgware Road was covered too and parts of Victoria. Thank you for letting me know. Location is very difficult to name as in a place in tarot though directions are generally fairly reliable in most cases. I just write what I get but I will try to work further on this case. Was all Kensington checked? Here is an update on his possible frame of mind. The family of a missing London university student today appealed for help to find him, amid fears for his mental health. Yen Zhen Anthony Soh, known as Anthony, was last seen on March 22 after an evening drinking with friends at the Imperial College student union bar in South Kensington. The first-year mechanical engineering student, 18, left the bar at about 11pm. Friends reported him missing the next day when he failed to appear at lectures. His brother Jeff, 20, a third-year economics student at UCL, today told of his family's distress. He said: "He has always diagnosed himself as being bipolar, but he seemed fine. He was with 12 friends in the college bar and he was having a good time. "He left and was drunk but he headed towards his halls of residence. He was captured on CCTV but then suddenly disappeared from view. He's never done anything like this before so it's extremely worrying. "I'm just trying to keep a clear head and do what I can to find him. It has been very emotional and distressing for my family." Anthony was filmed turning on to Kensington Gore and is believed to have been heading back to his flat in Sussex Gardens, Paddington. Mr Soh said more than 2,000 people have joined a Facebook group to help find his brother. He added: "He is very intelligent and loves what he does at university. He has always been a top student and is gifted. He has always been very social and has a large group of friends." Thank you for this extra information. Tarot has given a few thoughts on Anthonys situation mainly pointing out North and Southerly directions which could be his start or destination point, agricultural aspects/water in the cards so must form some point of landscape within that. I have only given a very brief outline but I will try to work on this a bit more. Thank you again. It's really appreciated. This is the CCTV shot of Anthony entering and leaving the bar... just to give you a clearer picture of where he was before he went missing. Man's body found in Serpentine lake in Hyde Park. A walker spotted the body in the water at lunchtime. 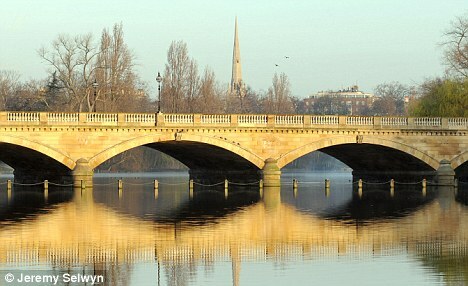 A body has been found in the Serpentine lake in London's Hyde Park. Police divers dragged the body from the lake at lunchtime after a walker spotted it in the water. Visitors walking through the park on the warmest day of the year so far were told to move away as police put a cordon up around the immediate area. The Metropolitan Police said the man's death was being treated as "unexplained". A worker at the park, who did not want to be named, said: "We had a few customers out on the lake and someone pointed out that there was something over there so I went and had a look. "It was just floating on the other side of the island. It was caught on one of the chains." A Scotland Yard spokesman said: "We were called at around 1250 BST to the Serpentine to reports a body had been seen. "Marine support teams recovered a man's body." It is thought to be Anthony. 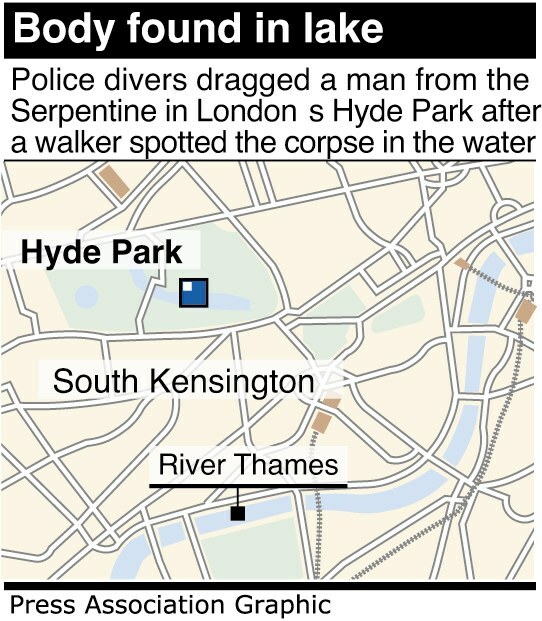 I can't understand why the body was not seen earlier however as the Serpentine is a very shallow lake. Terrible news, but what you said about checking water and 14 days. This has been confirmed. I just can't understand how if his body was in there for 2 weeks, no one noticed! It's an extremely busy area and the water isn't particularly deep. I know that he had to walk on the Serpentine bridge to cut through the park - I'm speculating that if he was very drunk he may have sat on it/leaned over and fallen in... I just can't understand how this happened or whether someone else was involved. I am so glad he was found and that tarot was helpful in this case. I am just sorry that he had to be found deceased. 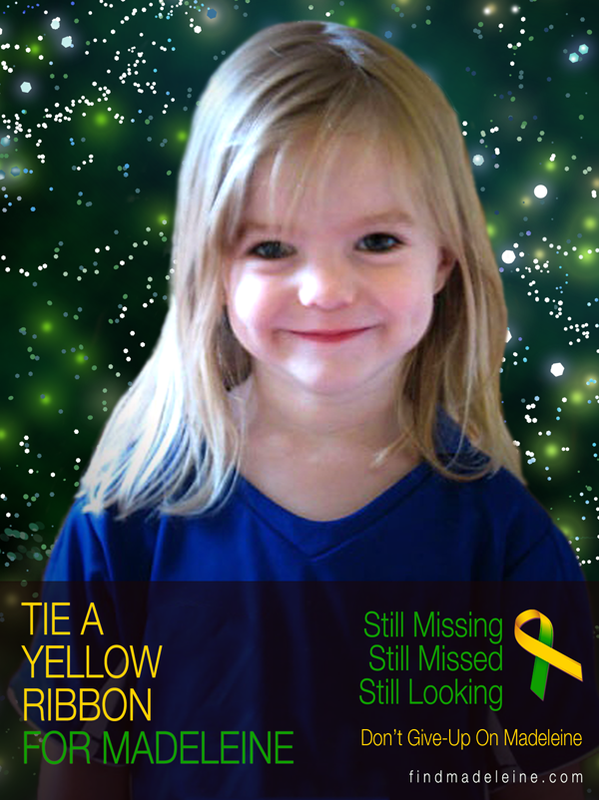 There are so many people going missing and being found in this way and it is truly very upsetting. My sympathies go to all his family and friends. Thank you all for updating and keeping the news coming here. Thank you for updating the latest news. It does seem strange to decide to have a swim at that time of night but I guess that is the conclusion they have come to. I am truly sorry for the news of Anthony, I wish it could have been different for him.